Sixty-six percent of voters in Bellingham, Washington said YES to the extension and expansion of a property tax levy that will produce $40 million for the Bellingham Home Fund over the next decade. Established by vote of the people with the passage of a levy in 2012, the Bellingham Home Fund had created more than 550 affordable homes and apartments and provided rental assistance and housing related services to nearly 6,000 Bellingham residents with low and very-low incomes. In 2012, 56% of voters approved a $21 million, seven-year levy and creation of the Home Fund. The 2012 levy was made possible by state law in Washington that allows for cities and counties to issue an emergency housing levy. RCW 84.52.105 authorizes cities, counties and towns to impose an additional regular property tax levy up to fifty cents per thousand dollars of assessed value of property for up to ten consecutive years. The ability to impose a levy is contingent on a city, county or town declaring an emergency in respect to the availability of affordable housing, a declaration made by the Bellingham City Council in the spring 2012. The voter approved levy in 2012 was a combination of the regular levy allowed under state law, and the emergency housing levy, split 1/3 regular levy and 2/3 emergency levy. Not only was the levy larger and with a longer duration in 2018, the 2012 levy actually has one year remaining before it expires. The decision to go back to voters early (i.e. pre 2019 when the original levy expires) was driven both by the steadily increasing housing costs in Bellingham and the strategic advantages of aligning a levy vote with the high turnout of likely supporters for 2018 midterms. The result affirms the decision, with two thirds of the Bellingham electorate voting in favor of the $40 million levy, following the 1/3 regular levy and 2/3 emergency levy formula on the 2012 levy. The Bellingham Home Fund provides affordable housing for seniors, veterans, people with disabilities, and working families at or below 80% Area Media Income (AMI), with two-thirds of the funding dedicated to households at or below 50% AMI, a requirement for the emergency levy funds. The Home Fund has three primary programs: Production and Preservation, Rental Assistance and Supportive Services, and Homeownership. The Production and Preservation program is geared to provide affordable rental housing for households at or below 60% AMI through new construction, preservation, rehabilitation and weatherization. The Rent Assistance and Supportive Services program provides: Supportive services matched to specialized homes for disabled veterans and people experiencing homelessness and temporary and long-term assistance to prevent eviction and homelessness. The Homebuyer Program provides assistance to households at or below 80% AMI and includes programs that promote long-term affordability of ownership housing. A core asset for the campaign was the track-record of the Home Fund. When presented to voters in 2012, proponents of the Home Fund pledged to impact benchmarks for all three program areas. In the first six years of operation, the Home Fund has delivered and exceeded the stated goals. The seven-year goal for Production and Preservation was 417 apartments and rental homes. In six years, the Home Fund has produced 514, with funding commitments made to an additional 207. The Rental Assistance and Supportive Services program projected serving 2,250 people, and has already served 5,935. The Homebuyer Program is on track of 50 homes goal for ownership housing, with 45 complete, and funding committed to the additional five. 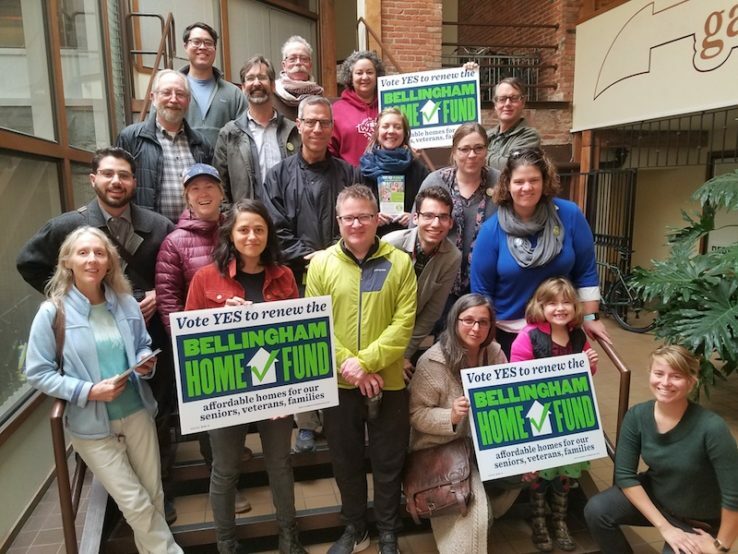 More than just running on the Home Fund’s record of impact and success, the coalition leading the campaign drew from the playbook that led to the voter’s approving the Home Fund in 2012: Build a big tent of supporters from all sectors of the community and make the campaign about the people in Bellingham who will benefit from the levy’s renewal. One third of the campaign’s $75K donations came from health care organizations: clinics, Medicaid managed care organizations, and the local hospital. Health-related coalitions are natural allies because housing stability is an important determinant of health. Sixty-three organizations and businesses and nearly 200 individuals publically endorsed the levy. Among the organizations and businesses endorsing were several health care organizations, the realtor association, the chamber of commerce, labor, and a brew pub.